Pipers Cottage in Knightwick, near Bromyard, Worcestershire sleeps 6 people. Pipers Cottage near Bromyard is set in rural Worcestershire in the Teme Valley; this is a detached cottage which has its own hot tub. Situated in the hamlet of Knightwick and 6 miles from Herefordshire’s market town of Bromyard, Pipers Cottage is set within glorious walking countryside and is within 1 mile from a pub, located on the River Teme, which serves food and hosts a fortnightly farmer’s market. 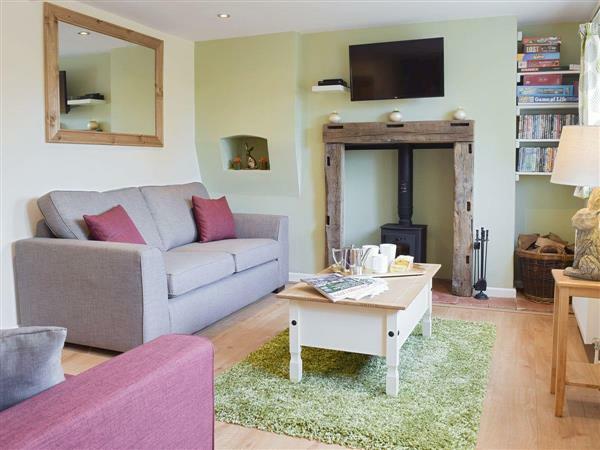 With an open-plan kitchen/dining room, excellent for socialising together, a cosy wood burner to snuggle in front of after a day in the countryside, and a hot tub in the garden to relax in, this is the perfect place in which to unwind with friends and family. In Bromyard you will find a bustling high street full of privately owned shops, cafés and pubs, and Bromyard Downs and Bringsty Common are right on their doorstep, with beautiful country space. This is a great base for a visit to the Marches and to attend the many fun and interesting events throughout the year. There are many pleasant towns and villages in the local area, including Malvern with its beautiful hills, Stourport-on-Severn and the cathedral cities of Worcester and Hereford, all of which are within half an hour drive. The shop is 3½ miles from Pipers Cottage near Bromyard, with the pub and restaurant 1 mile from Pipers Cottage. Living room: With wood burner, 40 Freeview TV and DVD player. Kitchen/dining room: With electric cooker with double oven, microwave, fridge and dishwasher. Bedroom 1: With zip and link super king-size bed (can be twin beds on request) and Freeview TV. Oil central heating, electricity, bed linen, towels and Wi-Fi included. Initial logs for wood burner included, remainder at small charge per basket. Travel cot, highchair and stairgate available on request. Welcome pack. Enclosed lawned garden with patio, garden furniture and barbecue. Hot tub for 6 (private). Private parking for 3 cars. No smoking. Please note: There are 5 steps in the garden to the lawned area. Holidays at Pipers Cottage run from Friday to Friday. For a better idea of where Pipers Cottage is, you can see Pipers Cottage on the map below. Pipers Cottage is in Worcestershire; should you be on the lookout for a special offer, you can find all the special offers in Worcestershire. It's always worth checking to see what is on offer at the moment. Do you want to holiday near Pipers Cottage (UKC3008), you can see other cottages within 25 miles of Pipers Cottage; have a look to find your perfect holiday location.